Our Auto Sentry Pay stations are designed to allow the customer to choose the right wash package for them. The screen and the voice announcer will guide you through the purchase process and will accept your payment. You may also print out a receipt or add value to your wash card right at the pay station. Please be aware of instructions posted before entering the tunnel. Our attendant's job is to make sure you and your vehicle navigate the wash tunnel safely and timely. Please lower all automatic antennae, turn off moisture sensing wipers and manual wipers, roll up windows and sunroofs. Extended truck mirrors should be folded in. Please no cell phone use or texting while in the wash process. All open bed pick-up trucks must be free of loose debris and trash inlucing any tie downs or straps. Our wash attendant will direct you on to the conveyor track to get you in position to start the wash. The rails are about 14 inches apart so require small adjustments from hand signals given by attendants. You may feel as if you have gone over a small bump as your wheel passes over the trap door to the conveyor. This is normal. Once the attendant gives you the halt sign, please put your car in neutral, take your foot off the break and hands off the wheel. This will allow the conveyor to control the speed and direction of your car for your safety and the safety of others in the wash tunnel. Once your car is prepped, the conveyor will eject a wheel pair that will push your vehicle along the conveyor. Our attendants may prep your car at the front of the tunnel depending on the wash service you have selected. Our equipment is state of the art and runs with a synchronized computer program that assures each wash purchased is given the proper sequesnce of services. When the wash and drying service is complete, an LED indicator will instruct you to "Drive Forward". 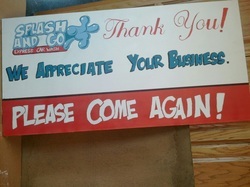 Thank you for washing at Splash and Go Car Wash!